Gone are the days of Google searching to see the latest Patent Trial and Appeal Board (PTAB) decisions. Instead of searching for decisions, some new, some outdated, Docket Alarm makes it easy to view every new decision published by the PTAB in one place. 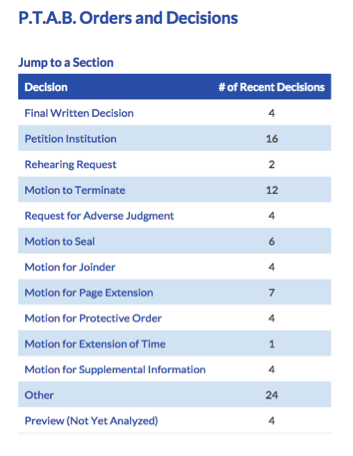 Docket Alarm’s dedicated PTAB orders and decisions page is organized by decision type, and includes categories like final written decision, petition institution, motion to terminate, motion for supplemental information, and more. For example, to view all recent PTAB Motions for Joinder, simply select the category. Each decision features a summary, highlighted issue tags, and links to the related proceeding and the underlying order itself. The summaries make it easy to quickly skim the list to find the most relevant developments. Docket Alarm’s PTAB orders and decisions page is continuously updated, so you know you are always viewing the latest information coming out of the PTAB. 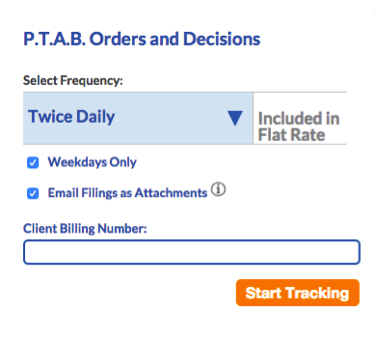 New PTAB decisions and orders can be sent to your inbox with Docket Alarm’s email alerts. 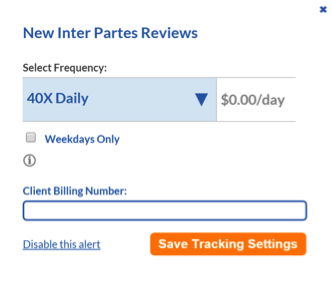 Click “Get Email Alerts!” to select the frequency at which you wish to receive updates: from once a day to continuously throughout the day. Each email alert contains a summary of the update, along with a PDF attachment of the decision or order. This eliminates the need to log in to keep up with the latest PTAB news. Sign up at www.docketalarm.comtoday to view and track the latest orders and decisions coming out of the Patent Trial and Appeal Board. While Docket Alarm was built to be a one-stop legal research and analytics platform, its uses go well beyond the legal sector. 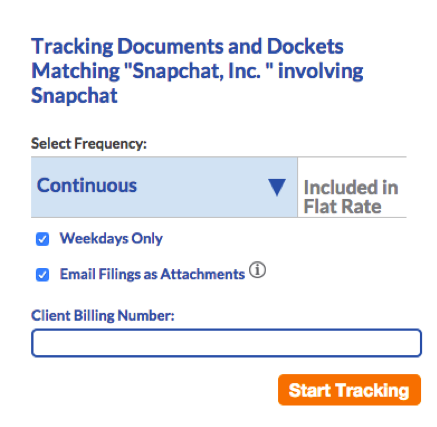 Financial firms use Docket Alarm’s features to help track and analyze influential court cases that have the potential to impact the stock market. Additionally, firms can save time by using Docket Alarm’s automated, up-to-the-minute analytics to evaluate publicly traded companies, potential borrowers, and other entities. Some court decisions are so important they impact national and international financial markets. Decisions from these cases can cause stocks to sink or soar. Financial firms need to track these cases and quickly analyze their outcomes in order to make beneficial trades from these momentum swings. Docket Alarm can help by providing day traders with immediate, up-to-the-minute updates on these important cases. Users can set up email alerts for publicly traded companies involved in litigation and have updates delivered right to their inbox as frequently as they wish. Docket alarm also has analysis software that provides users with near real-time case information along with the basic holding of each case. This information can be used by financial professionals to quickly determine a decision’s impact on the market. Case outcome have been known to cause market swings by 20%. Thus, informed traders who act early are in a unique position to benefit from these swings. Docket Alarm’s tracking and analytics provides financial professionals with the latest litigation updates to help them stay ahead of the market. Financial professionals can sign up today at www.docketalarm.com to receive the latest litigation updates that impact the market.